I gained 24 lbs with baby #1, 16 pounds with baby #2, and so far 4 pounds with baby #3 (21 weeks). 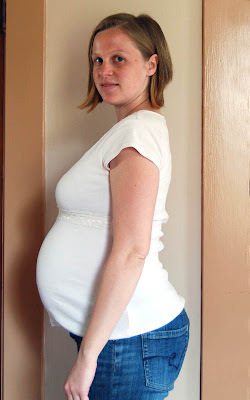 I lose my baby weight after each baby. #2 was bigger than #1. And I was WAY bigger. 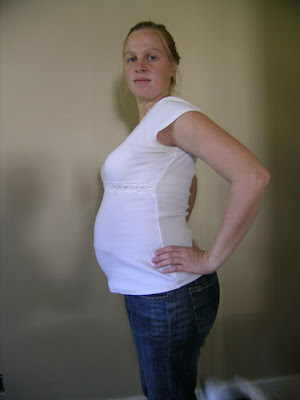 With #3, I am even bigger, already in third trimester clothes from #2. Will anything fit me at the end of my preganancy I'm wondering? I wish I had a house. 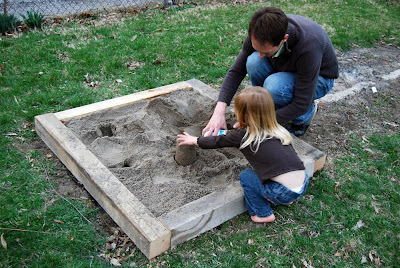 I'd love to do so many outdoor projects, like a sandbox, but I can't since we live in apartments. You look great, too! I know this is a rather old post, but may I ask how you used the pump? I have been looking for a pump for my upcoming birth and the price looks perfect on that one. How did you use it? Did you need a seperate hose? Thanks! I bought 10' of the right size tubing at a home improvement store. You'll want to buy a long enough piece that it reaches from your birth pool to either an outside window or a toilet.